We’ve all been there... you’re searching for a pre-owned car when you come across an awesome deal on what looks like the perfect vehicle. Then you click on the Carfax report only to find that yellow triangle that indicates “accident reported.” Carfax is now offering an online search tool to help filter these cars. I spend a large portion of my day on third party listing sites like Autotrader and Cars.com trying to find a specific new or pre-owned car for a customer. For some buyers an accident is not the end of the world, but many folks would rather just avoid the risk all together. So how does the Carfax listing site hold up to the established players? What I have found in the past when a new listing site pops up is that often they just don’t have the same level of inventory like Autotrader or Cars.com. I ran an unfiltered search for Mazda Miatas within 100 miles of my zip code. Carfax only found 18 cars, but Autotrader located 77 vehicles. If you are looking for a pre-owned car, inventory is everything. You don’t want to spend time on multiple sites looking at duplicate listings. Most buyers are going to stick with the default choices that have the most cars. Despite the lack of selection, I was curious to see how the accident filter works. You can even refine your search further in regards to service records, number of owners, or type of use in addition to using filters for the vehicle’s features. Clearly Carfax had enthusiasts in mind because you can search for Miatas with a limited slip differential. While an LSD is probably a “must have feature” for Miata buyers, for some strange reason you can’t search for cars with navigation. It simply is not on the list of available features. Even though many of us prefer our phones, a lot of used car buyers want navigation. The omission of this popular option could just be chalked up to the early development of the website, but I hope they make that fix soon. Another downside to the Carfax search is you can’t search for multiple makes and models at once. Often I get clients who are looking for a pre-owned vehicle in their area, but haven’t committed to a specific brand or model. They just want something in good condition, but Carfax doesn’t allow just to search by body style like the other sites do. One of the biggest drawbacks is you cannot narrow you search by “certified” pre-owned vehicles as many buyers shopping the lightly used market prefer a car with CPO coverage. While many automakers will only “certify” cars with clean accident histories, there are many CPO vehicles on the market that suffered minor damage. I would be nice to exclusively search accident free CPO vehicles. On the plus side, I did like the overall interface of the site and the individual listing pages were clean and easy to read. A really nice feature is click the car on the dealer’s website. Sometimes third party listings sites will have a car that has already been sold, so I usually will double check the inventory with that the dealer is listing on their site. If the dealer doesn’t have it anymore, chances are the car was sold. Carfax gives you an easy one click to see of the dealer still has your car. A clean Carfax is not always a guarantee of an accident free car, but with the wealth of used cars on the market many buyers want to eliminate those vehicles that have that yellow triangle on the report. 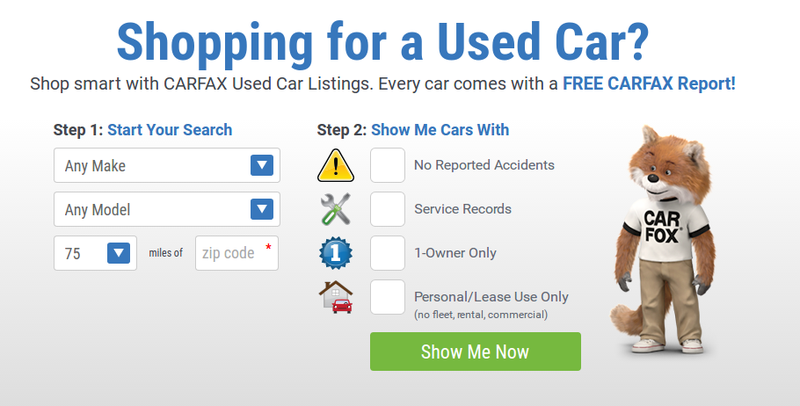 Carfax provides a user-friendly search if an “accident free” ride is your top priority. Unfortunately, the site is held-back by its limited inventory and the flexible filtering found on more popular sites.